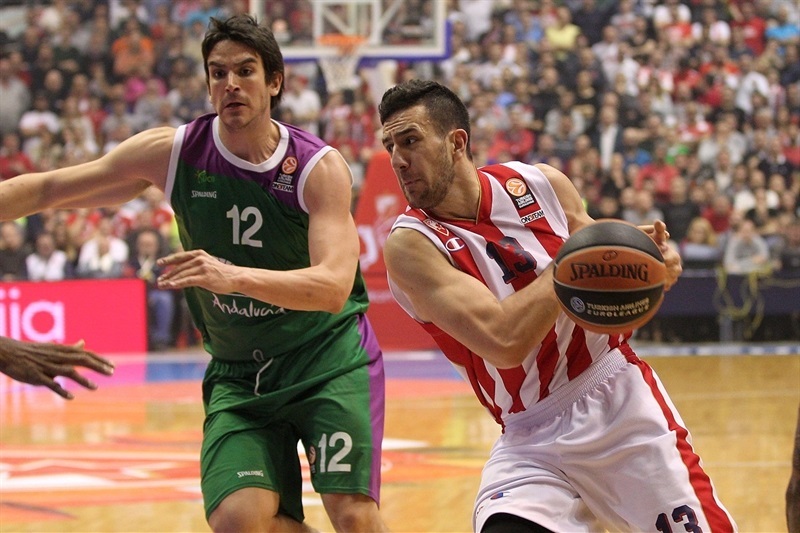 Crvena Zvezda Telekom Belgrade defeated Unicaja Malaga 87-73 in the Serbian capital on Friday for its second straight victory. 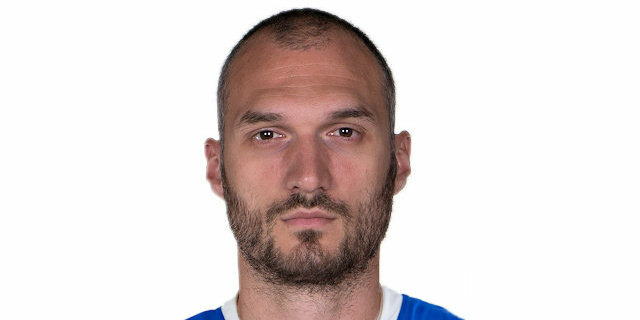 Both teams now have 2-2 records in Group E. Stefan Jovic led the winners with 15 points, Marko Guduric added 13, Marko Simonovic 12 and Maik Zirbes 10. Jamar Smith had 11 points for Unicaja, but none of his teammates scored in double digits. 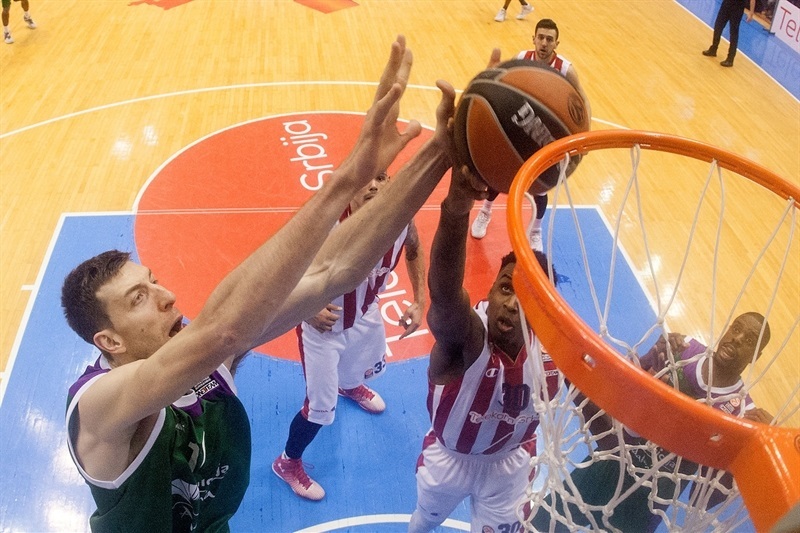 Mindaugas Kuzminskas shined early to give Unicaja a 7-10 lead. Zvezda found a go-to guy in Zirbes, who helped the hosts to a 21-14 lead after 10 minutes. Jovic soon made it a double-digit game, 31-19, and allowed Zvezda to stay way ahead, 41-31, at halftime. Unicaja improved its defense after the break, getting within 60-53 after 30 minutes and even closer, 60-57, early in the fourth quarter. Simonovic struck three times from downtown midway through the fourth quarter and Branko Lazic had all of his 9 points in the final 91 seconds to lead Zvezda to a well-deserved win. Both teams struggled to score early until Jovic made free throws. Will Thomas got Unicaja going with a backdoor slam as the visitors started to power the offensive glass. Kuzminskas finished a four-chance Unicaja offense with a three-pointer, but a layup by Jovic kept Zvezda close. Zirbes split foul shots and soon added a layup to put the hosts back ahead, 7-5. Kuzminskas solved a broken play with a driving layup and foul shots by DeMarcus Nelson restored a 7-9 Unicaja edge. Kuzminskas split free throws, but Zirbes found Quincy Miller for a two-handed dunk that ignited the crowd at 9-10. After Thomas hit foul shots, Zirbes scored around the basket and a three-pointer by Guduric gave the hosts a 14-12 edge. Zirbes kept pushing Zvezda with a put-back layup, after which Unicaja called timeout. Fran Vazquez sank a floater in the lane, but free throws by Vasilije Micic and Guduric boosted Zvezda's lead to 21-14 after 10 minutes. Guduric took over with an acrobatic three-point play to make it a double-digit game, 24-14, early in the quarter. Edwin Jackson struck from downtown, but Unicaja kept struggling to find good shots. 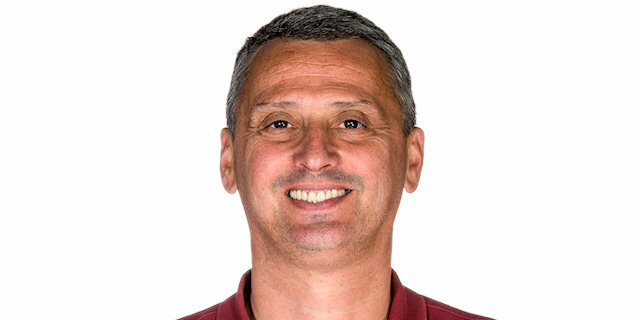 Vladimir Stimac finished a three-chance Zvezda offense with a put-back layup, which Carlos Suarez erased with a driving basket. Jovic buried a three-pointer and took over with a wild driving basket, which caused Unicaja to stop the game at 31-19. After Albert Diaz hit a mid-ranger jumper, Stimac answered with a layup and free throws by Suarez brought Unicaja a bit closer. Nemanja Nedovic shined with a driving layup, but Micic did better with a step-back triple, good for a 36-25 Zvezda margin. Diaz buried a six-meter jumper and Jamar Smith added a layup, but Nemanja Dangubic followed a tip-in with a corner triple for a 41-29 Zvezda lead. Nedovic scored in penetration to fix the halftime score at 41-31. Richard Hendrix, who had been scoreless until then, hit a mid-range jumper right after the break and Thomas added a close basket to bring Unicaja within 6. Zirbes rescued Zvezda with a three-point play that Smith erased with an eight-meter bomb. Miller answered from downtown and erased Jack Cooley's put-back basket with a driving layup. Thomas beat the shot clock with a step-back three-pointer, but free throws by Dangubic gave Zvezda a 51-43 lead. 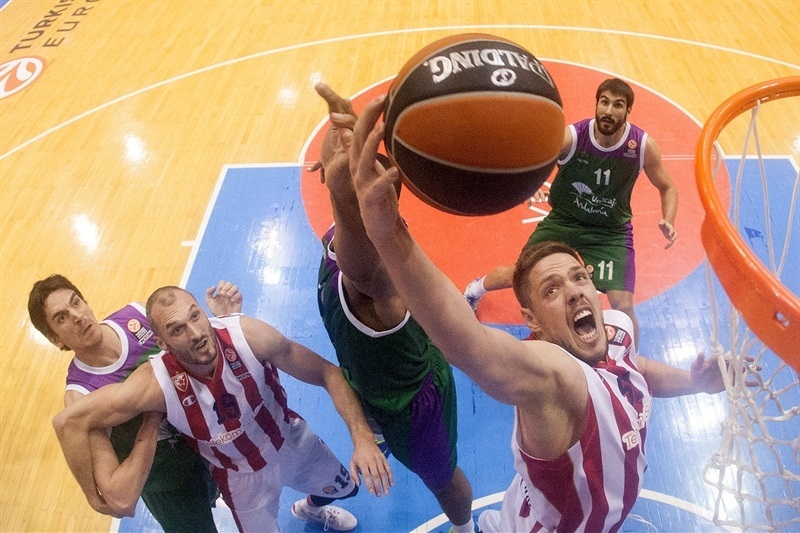 Smith insisted from beyond the arc, but Guduric restored a 53-46 Zvezda margin. After Cooley scored around the basket, Guduric took over with another driving basket and a fast break layup by Jovic made it a 9-point game. An unstoppable Cooley made free throws, but he didn't find much help around. 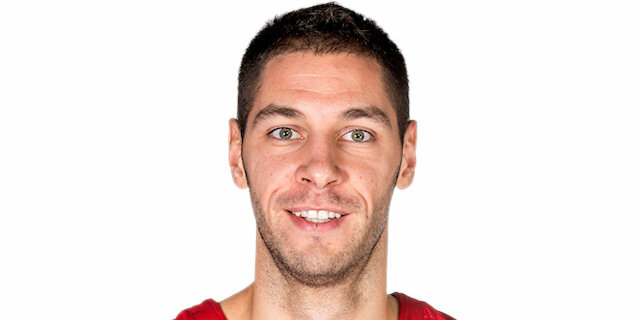 Simonovic downed a three-pointer from the left wing that prompted Unicaja to call timeout at 60-50. Smith sank another triple to keep Unicaja within 60-53 through three quarters. Nedovic took over with a driving layup early in the quarter and Nelson scored around the basket to make it a 3-point game at 60-57. Micic rescued the hosts with a driving layup and Simonovic added a catch-and-shoot triple that gave Zvezda plenty of fresh air, 65-57. Unicaja struggled to score when it mattered most, taking one off-balance shot after another against Zvezda's physical defense. Tarence Kinsey hit his trademark stop-and-pop jumper for a 68-57 Zvezda lead with over four minutes left. Diaz and Simonovic exchanged three-pointer and a layup by Vazquez gave Unicaja hope at 71-62. Simonovic buried his third triple in as many minutes, but Vazquez nailed a step-back jumper and a driving layup by Jackson caused Zvezda to call timeout at 74-66. Jovic scored around the basket and a three-point play by Branko Lazic sealed the outcome at 79-66 in the next-to-last minute. "This is a big victory for us. 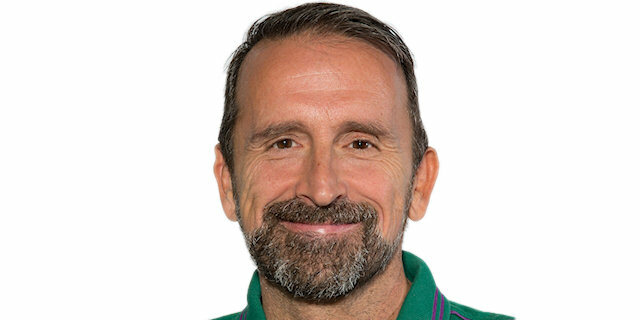 Unicaja is an excellent team with an excellent coach. We are growing game by game and day by day. We are a better tam now than we were yesterday. We opened the game playing good defense but Unicaja had so many offensive rebounds that they kept the game close. Unicaja showed its talent in the third quarter but we returned to play good defense in the last quarter and finaly won the game." 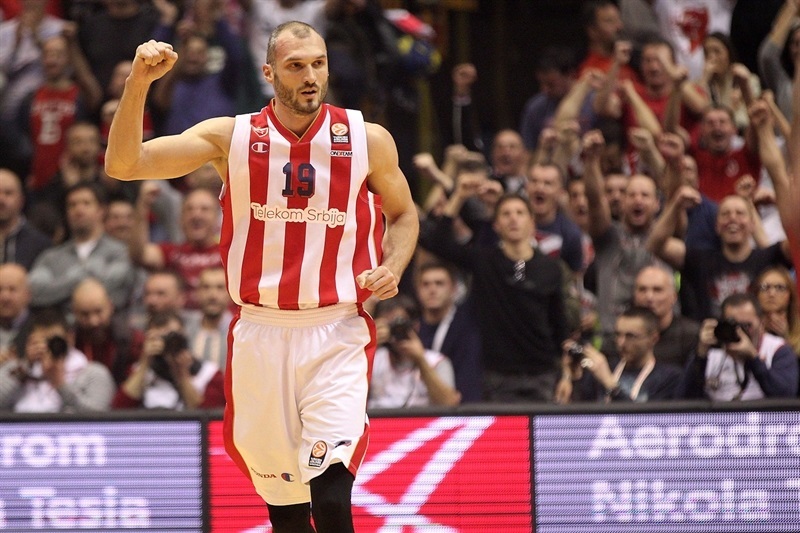 "Zvezda deserved the victory, 100%, they put a lot more energy and conviction in this game. I think we need to do more work on offense and defense. We are not able to play physical against Zvezda. Even when we were 5 points down in the beginning of the fourth quarter, we had some really crucial turnovers which didn't allow us to be in the game until the end. We didn't box out in our defensive rebounds and allowed 27 points in the fourth quarter, which means that you don't deserve to win the game at all. They tried to match our energy. When we arrived here in Belgrade, we were the best defense in the Top 16, in both groups. 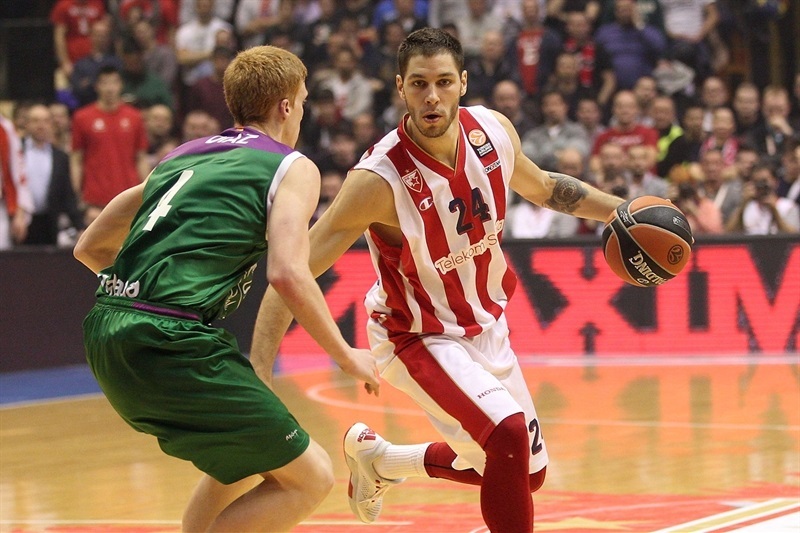 They showed their capacity to play good defense, here and on the road against Panathinaikos, in the last two games. The team that is able to more solid at home will have more chances to be in the playoffs. " "After this win, that first loss against Efes is Istanbul is even harder. Unicaja did a good job on offensive rebounds in the first half but we managed to limit that in the second half." "It was a very important game for us. They are a very good team, like I said before the game. They played very aggressive defense and they play like this for 40 minutes. They gave us a lot of trouble in the beginning of the game with their offensive rebounds. We kept fighting and playing well on defense and in the end, we scored some important points and we won. It was a big game for all of us and I thank to our fans for their support, all 40 minutes." 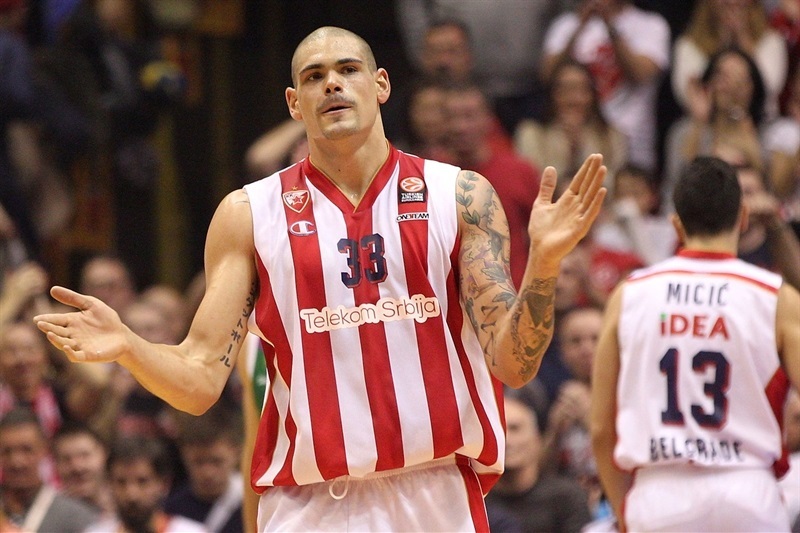 "It was emotional to play in Belgrade, in front of so many Crvena Zvezda fans again. I did not feel my legs at all in the beginning of the game. Our goal was to keep the game close until the final minutes but didn't manage to do it. They scored some big three-point shots and that was the key to their win."